A busy day with three runners at Benalla on Thursday including Buffalo Bill on debut. Buffalo Bill and Walton Hall both run in race three, the 3YO Maiden Plate over 1406m with Patrick Moloney aboard Buffalo Bill and Jason Benbow on Walton Hall. Buffalo Bill is a son of High Chaparral and bred to be better at middle distances but Mike Moroney is happy to send him to the races. “He’s ready to go and this looks a nice start off for him,” Moroney said. 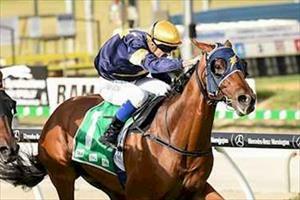 “He’s related to Let’s Elope so he should be needing further than 1400m to show his best. Walton Hall pleased Moroney with his debut fourth at Kyneton on January 16 and has done well since. “He’s a horse I think will be a bit better with some give in the ground so I’m hoping the predicted rain arrives,” Moroney said. Bianco Nuovo (pictured) is in race four, the Benchmark 58 Handicap over 2046m with Harry Grace to ride and reducing his weight to 59kg. “Unfortunately he missed his intended last start when the races were called off so he’s now five weeks between runs which is a query,” Moroney said. “He’s up in distance and back a bit in class which means he’s got a bit of weight which is why we decided to claim.